Ask the Publishing Guru: What is Your God Like? Tell Me About Your God! 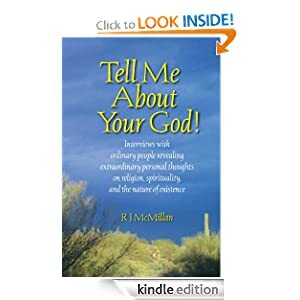 by R J McMillan offers readers a unique perspective on and of religion and spirituality through twenty interviews with a diverse array of people who share their individual thoughts and beliefs on the subject. Interwoven into the interviews are thought-provoking insights from McMillan, accompanied by his original poetry, and relevant famous quotes. McMillan, who has studied religions and spiritual disciplines for almost forty years and is certified in both NLP and EFT, is passionate about sharing alternative ideas with others and writes from the heart. After spending his early childhood “in the shadow of both the Queensboro Bridge and the Roman Catholic Church,” the author embarked on a quest for self-knowledge, leading him to the teachings by which he lives today—wisdom from such people as Deepak Chopra, Esther Hicks, Dr. Wayne Dyer, Neale Donald Walsch, and Ken Keyes, Jr.
His interviews and thoughts remind readers that their individual beliefs are valid and inspire the reader to ask and seek his own personal answers to the deeper and most important questions on life—those about the nature of God, heaven and hell, the purpose of life, and the true meaning of death. McMillan is a consultant and avid proponent of the Law of Attraction with a primary focus on the Teachings of Abraham, and offers free consultations to anyone interested. This authentic, down-to-earth approach will appeal to people from many different walks of life and religious and spiritual backgrounds, presenting them with new ideas and thought-provoking perspectives. Tell Me About Your God! will undoubtedly offer its readers pause for reflection, while stimulating interesting and revealing discussions on the topic. For more information on R J McMillan, please visit www.tellmeaboutyourgod.com , follow @RJMcMillan99 on Twitter , or email him directly at rjmcmillan@cox.net.